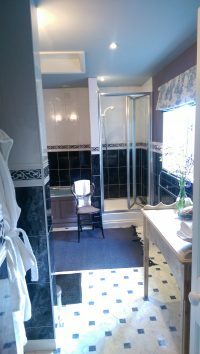 This room is situated upstairs and has a double aspect with a large alcove where the bed is situated. There is a feature wall behind the bed papered in a French Toile de Jouy and the walls are decorated in Parma Grey from Farrow and Ball. 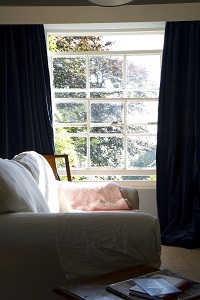 There is a sofa in the room to enjoy views of the Garden and the South Hams whilst the second window looks out to the Tor on Brent Hill. 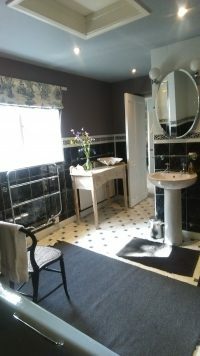 The very large bathroom was redecorated in 2011 in Brassica by Farrow and Ball and has an original 1960’s blue bath and separate modern shower. There is a lovely feature fireplace in the room and the bed is King size. 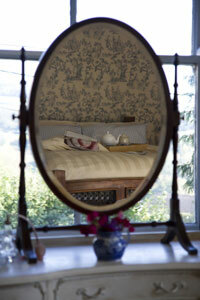 The consultants for this room have been Artisans and Artists from Ashburton.